In the Summer term, our then Year 5 children entered the above competition run by Sky and the World Wildlife Fund, by writing a news article about the Amazon Rainforest. The entries were judged by Sky News presenter Lorna Dunkley and representatives from the WWF, who chose Annabel Leyden’s entry as the winner and Fred Mott’s entry as one of the runners up. Both Lorna and the WWF were impressed by the excellent quality of the written reports submitted. They described Annabel’s report as “an excellent news report that would sit well in any environmental publication” and Fred’s as “a well written and brilliantly constructed report”. Yesterday, Lorna and representatives from Sky and WWF came to Collis to present the winners with their prizes: tickets to the Eden Project for Annabel and an animal adoption for Fred. The entrants to the competition also won £500 for the school to spend on Amazon resources, and a selection of books about the Amazon rainforest. 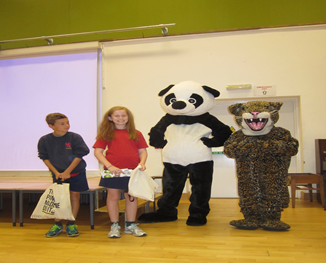 Lorna led the UKS2 assembly, which included a visit from Jimmy the Jaguar and Polly the Panda, who posed for photos with the winners. Afterwards, Lorna spent time with the current Year 5, answering questions about her job as a news reporter. Many congratulations to all those who entered the competition but especially to Annabel and Fred.